Got a second? Save a life. On August 20th, students all over Orange County began their 2012-2013 school year. Best Foot Forward volunteers joined crossing guards at 15 area schools, and while waving iYield4Peds signs, learned a bit about crossing guard etiquette, and yes, there are rules. Always allow the guard to push the crossing button, and do not begin crossing until the guard waves you into the crosswalk (as she approaches the center of the road). Continue across and don’t worry if the light changes. Our Orange County crossing guards have the right to keep drivers at bay, even when the light turns green. Students, parents and drivers need to respect the crossing guard at all times; after all, she has many lives in her hands. Now that Florida is enforcing its crosswalk laws, it is a good time for both drivers and pedestrians to brush up on good manners. As a driver, plan your trip and give yourself enough time so that you do not have to rush. Listen to your local traffic reports before departing. If traveling to a new place, check your favorite map site or GPS for traffic tips, alternate routes and expected time of travel. Take weather conditions into account, and then give yourself a few extra minutes….just in case. Stop at all red lights, do not change lanes excessively or pass on the right and don’t tailgate. All of these actions limit your sight at crosswalks. As a pedestrian, use the same common sense in planning your route and your time. 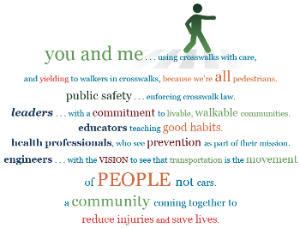 Always cross at the intersection, wait your turn at crosswalks and share the sidewalk. We always seem to become perfectly polite after natural disasters. Let’s recapture that sense of politeness and patience and keep everyone safe and on time. Enforcement of Florida’s pedestrian laws began in earnest August 14, after a summer of issuing warnings only. Channel 2 WESH’s Dave McDaniels followed along as Orlando Police ticketed 64 drivers who failed to yield to an undercover policeman. See the video here. We’ve got the numbers to prove it. Since beginning the Best Foot Forward campaign, compliance at monitored crosswalks has risen from 8.9% to 21%, clearly illustrating that through community-wide education, low-cost engineering and enforcement we can be successful in our efforts to keep our pedestrians safe. Thank you to all of our partners, friends and volunteers for making this a reality. Orlando Sentinel Poll – a resounding YES! BFF Newsletter #1 — Welcome to Your BFF Update!